The other day I ran into a friend at my office (aka Starbucks). He asked what my kids were up to this summer and the subject of workbooks came up. I confessed, as I’m doing to each and every one of you here, that I don’t make my kids do one single bit of school friendly learning all summer long. No workbooks. No flash cards. No educational camps. Nothing. I’m a firm believer that kids need a break from schoolwork. Not learning, but schoolwork. For 9 months out of the year, my kids are told they have to learn a certain way. They sit in a classroom, follow instructions, and learn the pre-determined curriculum. I’m lucky that it comes pretty easily to them (so far) and that they work hard for their teachers. I find that giving them 3 months a year to learn in very different ways is also important for their growth and development. He’s been reading. A lot. Not only did he finish his book club book in record time, he spent an afternoon chiseling a rock into an arrow like the character in the book. Not because it was an assignment, but because he had lots of free time and thought it would be fun. He’s also been writing letters to mail to friends and family. I love seeing how he thinks and what he wants to share. On top of that, he’s been to a couple sports camps. (He insisted on sports only this year.) He walked away from basketball camp learning a lot about character. He walked away from baseball camp with a new friend, as well as a coach who told him that he has the potential to be great, but potential without hard work means nothing. What awesome life lessons—on and off the field. Since we’re uptight techies and don’t let our kids use iPads/Phones 93% of the time (though their LeapFrog devices get plenty of play), come airplane rides, they have free reign. We added Sky Fish Phonics—a fun, educational app our friend created for early readers—to the iPad and he couldn’t get enough. By the time we got home from vacation, he was asking to read to me at night. So together we’ve been exploring books he can read. Not because I think he should, but because he thinks he can. He’s also made a couple of his own board games with paper and markers, had some seriously fun bug-hunting playdates with buddies, and has been writing more of his own songs (with Big’s spelling help—win/win!). She’s been doing everything in her power to learn how a 3-year old can act like a teenager. And she’s nailing it. Oh, and all of the kids recently pulled out the marble tracks we created last summer. Physics, teamwork, problem solving, conflict management, injury treatment…the lessons are endless! Now that our summer is slowing down, and we’re bound to have more time for edutainment, I’m excited to have Common Sense Media’s Summer Learning Guide. My favorite part about it is that it’s not organized like a classroom schedule (i.e. reading, math, etc.). The categories include: Explore the World, Hands-On Science, Get Creative, Tinkering & Tech, Learn Together, and Multimedia Memories. The guide offers ideas for kids ages 2-17, so no matter where you are in your parenting journey, you’re bound to come out with a win or two. What about you? 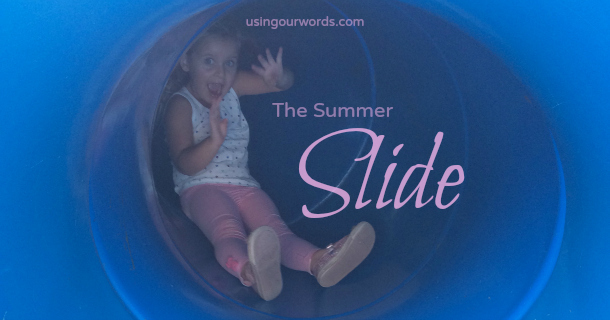 Do you worry about the summer slide? Or do you ride it (no hands!) like we do? This post was inspired by Common Sense Media’s Summer Learning Guide. As a Common Sense Media Learn ON Ambassador, I’m honored that I get the chance to share Common Sense Media’s great work. This non-partisan, not-for-profit company is helping parents everywhere navigate the new digital landscape, and even the most tech-savvy people I know turn to them for help. I hope you will too. Thank you!!! I feel exactly the same, and have been criticized. My daughter goes to music camp and regular summer day camp and reads endlessly, and sleeps! And my son has spent his summer composing on the piano and learning the songs he’s been performing in a summer vocal contest. Things that they don’t have the time to commit to fully during the school year. They explore the internet, spend time with friends and family, hang out with their dogs, swim – and get the relaxation and stimulation of different parts of their brains. 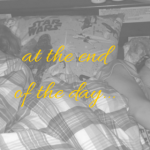 We have our whole adult lives to ‘work’ 12 months of the year – we only have a few years to be kids and in the summer to often not have a schedule or a requirement. We push our kids so hard, too hard during the school year – this is the time when they can relax and explore. And I say we need to let them. Absolutely, Heather! You won’t hear any criticisms from me. It sounds to me like your kids are plenty busy during the summer. Enjoy! The only structured thing we do during the summer is bedtime stories. I read to my seven-year-old daughter for 30-45 minutes and then she reads to herself for 30 minutes (or longer on Friday and Saturday nights because I let her stay up to read as long as she likes). What she reads is up to her. We follow this pattern during the school year as well. She went to art camp and nature camp this summer and is quite active with dance classes as well. But she still has a lot of free time to play. I did buy her a math workbook and put a cash bounty on completing it by the end of the summer, but it has barely been touched. That’s fine. I believe it is my job to create the opportunities but I don’t want to be an ogre about it. She is doing great and I’m very proud of her. This is exactly how I feel. I notice over the summer that they become passionate about learning new things again. 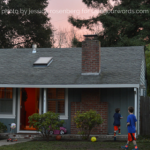 They have goals of their own…and they happen to all relate to their own personal dreams. The eldest is writing songs, the middle is programming code, and the youngest is running a hundred different businesses (which she sells to her subdivision of animals). I would love to agree with that….More than you know. However it is not an option for my dyslexic son and many many others who struggle school. And quite frankly they need the break the most. Every single day of school is a struggle to get through. Every single day he is confronted that he is reading well behind his peers, is pulled out for specialized learning, is constantly different. School has never ever been easy AND we reward this by….giving him summer school! Yes, it is true. However, without summer school (or private tutoring) he will fall even farther behind. I’m jealous of kids and families who can genuinely take time from structured instruction. Enjoy it. It’s more of a gift than you know! Peace. Kim, I absolutely relate and understand where you’re coming from. I grew up with a severely dyslexic sibling who was constantly having to do extra. I know each family has to do what’s right by their child. In our family’s case, the more work that was forced, the more resistance and struggle there was. A break was vital for my sibling and my outrageously hard working, dedicated mom. I hope you and your son find ways to escape the struggle to focus on his strengths and passions this summer too!